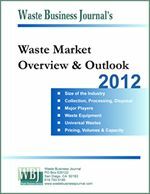 A new survey finds that Americans feel most guilty about wasting food and to a less extent about not recycling. The survey, called Eco Pulse, found 39% of 1,013 respondents felt guilty about wasting food and also felt guilty about leaving the lights on (27%), wasting water (27%), failing to unplug chargers for electronics (22%), not recycling (21%) and forgetting to bring reusable bags to the store (20%). "We know that telling people to save the planet does not work. The vast majority of Americans don't care," said Suzanne Shelton, CEO of the Shelton Group, which authored the study and consults organizations on sustainability initiatives. Swisher Hygiene (Charlotte, NC), which is in the midst of an investigation into improper accounting procedures, said that President Steven Berrard is stepping down, effective immediately. The company which provides commercial sanitation services as well as waste collection appointed EVP Thomas Byrne interim president and CEO. Berrard will continue as a member of the company's board of directors. Berrard is a long-time business partner of Wayne Huizenga, Swisher's chairman, who controls nearly 14 percent of the shares. Waste Management, Inc. (Houston, TX) has opened a new 3.2 megawatt landfill gas-to-energy plant at its Twin Bridges landfill in Danville, IN (about 20 miles west of Indianapolis). It is the fourth gas-to-energy plant at the site which now collectively generates enough electricity to power 14,000 homes. 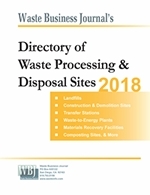 The plant is one of 14 landfill energy facilities owned by Wabash Valley Power Association throughout northern Indiana that are located at Waste Management landfills and operated by Waste Management under an exclusive partnership. "In 2007, our Board of Directors set a goal to increase our ownership of diverse fuel resources," explained Greg Wagoner, Vice President of Business Development, Wabash Valley Power. Progressive Waste Solutions Ltd. (Toronto, ON) has appointed Ian Kidson as vice president and chief financial officer. He succeeds Thomas Cowee who leaving to pursue other opportunities closer to his home in the Dallas/Fort Worth, Texas area. Kidson most recently served as managing director and co-head TD Capital Mezzanine Partners for 10 years, leading subordinated debt and equity investments in North American businesses in sectors including waste management among others. In June 2000, he led an investment in Progressive, then called BFI Canada, when the company acquired its original assets.